Coca-Cola Store, online at coca-colastore.com, is the place to go to find all the official Coca-Cola products and collectibles. Coca-Cola Store carries a huge selection of goods for those who are huge fans of Coca-Cola. Among the products that you will find at Coca-Cola store there are serving items such as glasses, tumblers and mugs, Coca-Cola apparel for men, women and kids, as well as home decor items including signs, clocks, furniture and so much more. Coca-Cola Store even offers a variety of collectibles such as keychains, bottles, magnets, retro tins, toys and so much more. So if you are a Coca-Cola fanatic then stop by the Coca-Cola store and see what they have for you. First, checkout RetailSteal to find the best Coca-Cola Store coupon codes, Coca-Cola Store discounts, and Coca-Cola Store promotions. 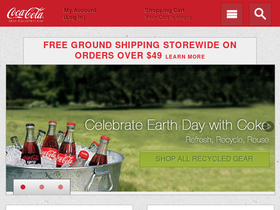 Coca-Cola Store offers free standard ground shipping on all orders over $49. Expedited shipping methods include next day and second day shipping at an additional charge. International shipping is an option with Coca-Cola orders. See website for full details, exclusions may apply. Use our coupon code online at Coca-Cola Store now to receive a 10% discount on merchandise. Click link to shop. Enjoy a free t-shirt from Coca-Cola Store online today when you use our coupon code at checkout with your $175+ purchase. Enjoy 20% savings on your entire order from Coca-Cola Store when you use this coupon code online. Use code on orders of $50+ to qualify. Enjoy a $15 discount on your entire order from Coca-Cola store when you use this coupon code online. Use code on orders of $100+ to qualify. Use this coupon code on Coca-Cola Store to save 40% on a pack of Coca-Cola bottles. Click to save. Shop the clearance section at Coca-Cola Store to save up to 60% on select items. Use this coupon code at Coca-Cola stores to save 30% on a pack of bottles. Click to save. Enjoy a 15% discount on your entire order from Coca-Cola store when you use this coupon code online. Use code to shop now. Save 15% on all online orders at the Coca-Cola Store with the coupon code. Click link for savings. Take 20% off any order when shopping online using the coupon code for a limited time. Click to save. Don't miss out on free shipping for a limited time at the Coca-Cola Store when you spend $49 or more.